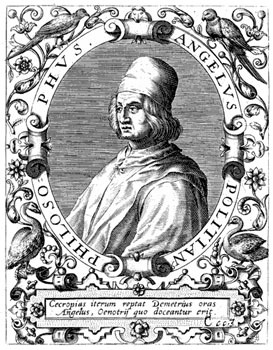 Politian, born Angelo Ambrogini, known in literary annals as Angelo Poliziano or Politianus from his birthplace, was born at Montepulciano in Tuscany on the 14th of July 1454. His father, Benedetto, a jurist of good family and distinguished ability, was murdered by political antagonists for adopting the cause of Piero de Medici in Montepulciano; and this circumstance gave his eldest son, Angelo, a claim on the family of Medici. At the age of ten the boy came to prosecute his studies at Florence, where he learned Latin under Cristoforo Landino, and Greek under Argyropulos and Andronicos Kallistos. From Marsilio Ficino he imbibed the rudiments of philosophy. The precocity of his genius for scholarship and poetry was early manifested. At thirteen years of age he began to circulate Latin letters; at seventeen he sent forth essays in Greek versification; at eighteen he published an edition of Catullus. In 1470 he won for himself the title of Homericus juvenis by translating four books of the Iliad into Latin hexameters. Lorenzo de Medici, who was then the autocrat of Florence and the chief patron of learning in Italy, took Poliziano into his household, made him the tutor of his children, and secured him a distinguished post in the University of Florence. Before he reached the age of thirty, Poliziano expounded the humanities with almost unexampled lustre even for that epoch of brilliant professors. Among his pupils could be numbered the chief students of Europe, the men who were destined to carry to their homes the spolia opima of Italian culture. Not to mention Italians, it will suffice to record the names of the German Johann Reuchlin, the English Grocyn and Linacre, and the Portuguese Tessiras. Poliziano had few advantages of person to recommend him. He was ungainly in form, with eyes that squinted, and a nose of disproportionate length. Yet his voice was rich and capable of fine modulation; his eloquence, ease of utterance and copious stream of erudition were incomparable. It was the method of professors at that period to read the Greek and Latin authors with their class, dictating philological and critical notes, emending corrupt passages in the received texts, offering elucidations of the matter, and pouring forth stores of acquired knowledge regarding the laws, manners, religious and philosophical opinions of the ancients. Poliziano covered nearly the whole ground of classical literature during the years of his professorship, and published the notes of his courses upon Ovid, Suetonius, Statius, the younger Pliny, Quintilian, and the writers of Augustan histories. He also undertook a recension of the text of the Pandects of Justinian, which formed the subject of one of his courses; and this recension, though it does not rank high in the scale of juristic erudition, gave an impulse to the scholarly criticism of the Roman code. At the same time he was busy as a translator from the Greek. His versions of Epictetus, Herodian, Hippocrates, Galen, Plutarch's Eroticus and Plato's Charmides delighted contemporaries by a certain limpid fluency of Latin style and grace of manner which distinguished him also as an original writer. Of these learned labors the most universally acceptable to the public of that time were a series of discursive essays on philology and criticism, first putlished in 1489 under the title of Miscellanea. They had an immediate, a lasting and a wide renown, encouraging the scholars of the next century and a half to throw their occasional discoveries in the field of scholarship into a form at once so attractive and so instructive. Poliziano was not, however, contented with these simply professorial and scholastic compositions. Nature had endowed him with literary and poetic gifts of the highest order. These be devoted to the composition of Latin and Greek verses, which count among the best of those produced by men of modern times in rivalry with ancient authors. The Manto, in which he pronounced a panegyric of Virgil; the Ambra, which contains a beautiful idyllic sketch of Tuscan landscape, and a studied eulogy of Homer; the Rusticus, which celebrated the pleasures of country life in no frigid or scholastic spirit; and the Nutricia, which was intended to serve as a general introduction to the study of ancient and modern poetry -- these are the masterpieces of Poliziano in Latin verse, displaying an authenticity of inspiration, a sincerity of feeling, and a command of metrical resources which mark them out as original productions of poetic genius rather than as merely professorial lucubrations. Exception may be taken to their style, when compared with the best work of the Augustan or even of the Silver age. But what renders them always noteworthy to the student of modern humanistic literature is that they are in no sense imitative or conventional, but that they convey the genuine thoughts and emotions of a born poet in Latin diction and in metre moulded to suit the characteristics of the singer's temperament. Poliziano was great as a scholar, as a professor, as a critic, and as a Latin poet at an age when the classics were still studied with the passion of assimilative curiosity, and not with the scientific industry of a later period. He was the representative hero of that age of scholarship in which students drew their ideal of life from antiquity and fondly dreamed that they might so restore the past as to compete with the classics in production and bequeath a golden age of resuscitated paganism to the modern world. Yet he was even greater as an Italian poet. Between Boccaccio and Ariosto, no single poet in the mother tongue of Italy deserves so high a place as Poliziano. What he might have achieved in this department of literature had he lived at a period less preoccupied with humanistic studies, and had he found a congenial sphere for his activity, can only be guessed. As it is, we must reckon him as decidedly the foremost and indubitably the most highly gifted among the Italian poets who obeyed Lorenzo de Medici's demand for a resuscitation of the vulgar literature. Lorenzo led the way himself, and Poliziano was more a follower in his path than an initiator. Yet what Poliziano produced, impelled by a courtly wish to satisfy his patron's whim, proves his own immeasurable superiority as an artist. His principal Italian works are the stanzas called La Giostra, written upon Giuliano de Medici's victory in a tournament; the Orfeo, a lyrical drama performed at Mantua with musical accompaniment; and a collection of fugitive pieces, reproducing various forms of Tuscan popular poetry. La Giostra had no plan, and remained imperfect; but it demonstrated the capacities of the octave stanza for rich, harmonious and sonorous metrical effect. The Orfeo is a slight piece of work, thrown off at a heat, yet abounding in unpremeditated lyrical beauties, and containing in itself the germ both of the pastoral play and of the opera. The Tuscan songs are distinguished by a "roseate fluency", an exquisite charm of half romantic, half humorous abandonment to fancy, which mark them out as improvisations of genius. It may be added that in all these departments of Italian composition Poliziano showed how the taste and learning of a classical scholar could be engrafted on the stock of the vernacular, and how the highest perfection of artistic form might be attained in Italian without a sacrifice of native spontaneity and natural flow of language. It is difficult to combine in one view the several aspects presented to us by this many-sided man of literary genius. At a period when humanism took the lead in forming Italian character and giving tone to European culture, he climbed with facility to the height of achievement in all the branches of scholarship which were then most seriously prized -- in varied knowledge of ancient authors, in critical capacity, in rhetorical and poetical exuberance. This was enough at that epoch to direct the attention of all the learned men of Europe on Poliziano. At the same time, almost against his own inclination, certainly with very little enthusiasm on his part, he lent himself so successfully to Lorenzo de Medici's scheme for resuscitating the decayed literature of Tuscany that his slightest Italian effusions exercised a potent influence on the immediate future. He appears before us as the dictator of Italian culture in a double capacity -- as the man who most perfectly expressed the Italian conception of humanism, and brought erudition into accord with the pursuit of noble and harmonious form, and also as the man whose vernacular compositions were more significant than any others of the great revolution in favor of Italian poetry which culminated in Ariosto. Beyond the sphere of pure scholarship and pure literature Poliziano did not venture. He was present, indeed, at the attack made by the Pazzi conspirators on the persons of Lorenzo and Giuliano de Medici, and wrote an interesting account of its partial success. He also contributed a curious document on the death of Lorenzo de Medici to the students of Florentine history. But he was not, like many other humanists of his age, concerned in public affairs of state or diplomacy, and he held no office except that of professor at Florence. His private life was also uneventful. He passed it as a house-friend and dependant of the Medici, as the idol of the learned world, and as a simple man of letters for whom (with truly Tuscan devotion to the Saturnian country) rural pleasures were always acceptable. He was never married; and his morals incurred suspicion, to which his own Greek verses lend a certain amount of plausible coloring. In character Poliziano was decidedly inferior to the intellectual and literary eminence which he displayed. He died, half broken-hearted by the loss of his friend and patron Lorenzo de Medici, on the 24th of September 1494, just before the wave of foreign invasion which was gathering in France swept over Italy.